The ongoing economic recession is putting lots of people in difficult situations. For some, the situation may even seem hopeless. I’m writing this to remind everyone to never give up. Who knows for sure what’s in store in the future, but the main thing is to keep your head together and just keep on going. Look for alternative ways of doing things. Mainstream media and mainstream thinking, which are partially responsible for the mess we’re in, assumes the economy is rolling along and everybody has money. That’s certainly not the current reality. Again, think outside the box to find dirt cheap or even free ways of doing things: alternative lifestyles, alternative incomes (not necessarily a full time job, just a way to make enough money to get by), or alternative building using natural, minimally processed local and recycled materials. The following excerpt is from one of my articles in The Last Straw journal. Typically, the roof is the most expensive part of a building. Trusses or rafters, sheathing, roof insulation, and roofing – shingles, metal roofing, tile, etc. – are all major expenses. Tarpaper, fascia, fasteners, soffit work, flashing, and roof vents all add up. And, the time and cost of labor to build a conventional roof is significant. Now imagine virtually eliminating all of these costs and you’ll begin to appreciate the simplicity of the Haystack House. (Actually, straw is used but somehow the term ‘haystack’ seems appropriate.) The idea occurred to me while observing stacks of rice straw that are common throughout Thailand. 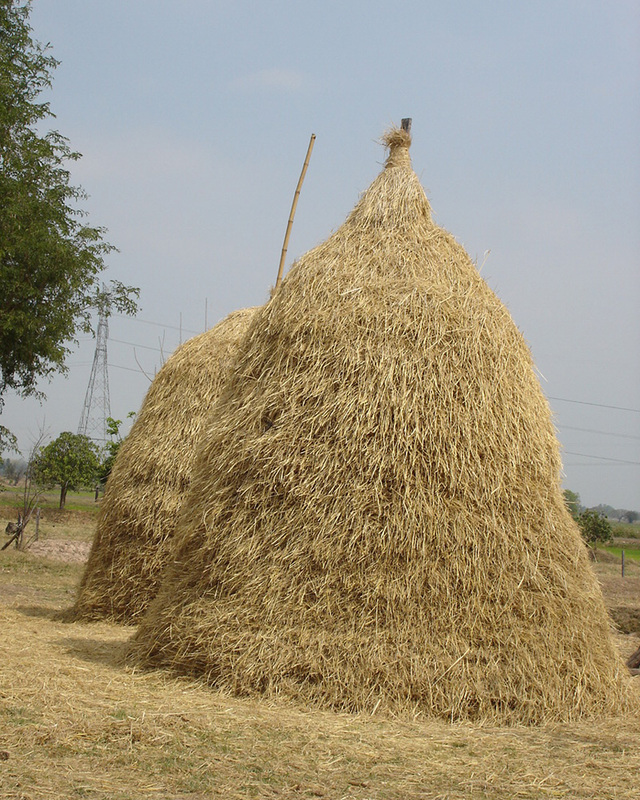 After harvesting the rice, farmers store the straw in large, conical or domed stacks. Sometimes the stack is raised off the ground on a pole structure. Why not raise the stack a little higher and create a living space underneath? The farmers are making the stacks every year regardless, so the only extra labor for the roof is the ladder work. A haystack overhead creates a super-insulated roof to protect against the withering heat in tropical climates. Most houses in Thailand are uninsulated metal-roofed houses, so this idea offers a significant improvement in comfort and eliminates any need for an air conditioner. In keeping with local building traditions, a post and beam frame makes sense. Eucalyptus is a good choice of wood for pole building. It’s grown in Thailand and other countries for pulpwood, and is low cost and naturally insect resistant. Recycled wood is another good option. The finished “roof” (haystack) creates a shady workspace to finish the rest of the structure at a leisurely pace. The beauty of this design is in its timeless simplicity. Humans have created their own shelter for countless years using available natural materials. Only recently have we started turning this task over to contractors, and the result has been escalating construction costs, excessive debt, often shoddy workmanship, and sterile looking, unhealthy buildings. – Limitations: Best for small, simple, single-family residences in rural areas. 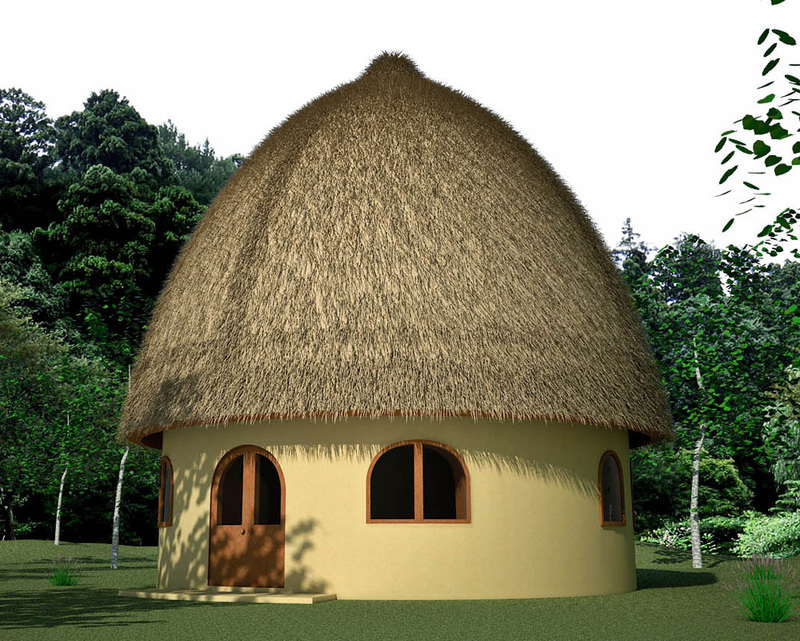 – Shapes: Conical roofs for roundhouses may be the simplest. Hexagonal, octagonal, other multi-sided shapes (pyramidal, polygonal, etc. ), and hip roofs are all options. An oval house is another interesting possibility. – Pole frame: Roundwood is less expensive and inherently stronger than milled wood. Notch the posts for the bond beam. – Decking: This is what supports the haystack. Recycled wood and bamboo are two options. Treat any structural bamboo with borax; otherwise insects will quickly devour it. Ideally, the decking would be moisture and rodent proof. Creating a slight curvature with bowed lumber (so the center of the deck is higher than the edges) would help drain away any water that gets through the straw. – Loft space: Add floor joists if you decide on a loft. To form the loft space, make a simple framework of bamboo and mound the straw against it. In other words, you could have a loft inside the haystack. – Miscellaneous: Add a tamped earth floor, cob and/or bamboo furniture, earthen plaster, mosquito net over the bed, and earthen oven, grill and thatched roof verandah for outdoor living and you’ll be well on your way to a small, cozy, dirt cheap bungalow. Worried about fire hazards and building codes? Move to a developing country, live simply with few possessions and leave your cares behind! Build a house like this for a few hundred dollars and enjoy life. Full text available by ordering the back issue of The Last Straw journal. I’m thinking of putting up one of these and then building under it with earthbags. Is this viable? Also, can you get earthbags up to an existing roof or do you plan to leave a space for ventilation? Yes, but you need room to work. (Tamp the bags, etc.) Don’t put the thatch on until the earthbag walls are finished. I was recently struck by an obvious reality that is defied by marketing. The phrase “Financial Independence” is bandied about in a completely upside-down fashion. Independence from a thing is not achieved by having a lot of that thing. You cannot have independence OF a thing, so this phrase is oxymoronic as placed. I cannot achieve “Heavy Rocks Independence” by carrying a lot of heavy rocks on my back. I cannot achieve “Stupidity Freedom” by being really, really stupid. Expensive, shoddy, high-maintenance housing is a massive burden. You cannot achieve any kind of freedom by burdening yourself with them. Having more money only results in being extorted of more of it, and then you have to kill, maim, and destroy to get more… It’s a social and fiscal downward spiral that can have only one outcome. No decent person would participate. The further one gets from math, science, and common-sense, the more expensive it becomes to maintain that distance. Expensive always, always, always equates to dangerous, destructive, and dumb. Independence and Freedom, by definition, come from elimination of encumbrances, not an accumulation of them. For me, the situation is hopeless. For this building anyway. I’m really looking forward to seeing more on the geopolymer boulder-type houses while I look for a suitable (cheap) chunk of land. HayStack Roof… what stops the hay from blowing away and also how often would it need to be replaced? I can only speak for the ‘hay stacks’ (mounds of straw) in my area. There’s a center pole such as bamboo. Vertical bundles of straw about 5″ diameter are leaned against the pole. More and more bundles are added from all sides as a dome shape is created. I’m not sure, but I think the outer part is loose straw. The straw probably locks together somewhat as it’s piled on the stack. The straw is fed to livestock during the rainy season, while the rice is growing. The stacks are made every year regardless. The only extra work is putting the straw on top of the roof. You may be able to remove and replenish just the outer layer. The whole stack would probably have to be replaced after the second year where we live (a ‘dry area’). Areas with heavy rain may need a new stack every year.